Although Mario games were widely played in China beginning in the 1980s, it was World of Warcraft that kicked off computer games with its beta in 2005. It took time for computer games to take off in China due to slow internet connections, but when they did, they quickly drew the attention of Chinese authorities, causing a number to be censored or banned. As creative products (like video games) gain in popularity in China, Chinese authorities crack down and regulate. Mobile games snuck up on Chinese authorities at an even greater rate than PC games of the prior decade – suddenly appearing and then rapidly spreading to the masses. To the government, games seemed to come with a host of problems due to their widespread popularity, including an influx of lawsuits and IP issues with international entities. As with PC games from decades before, mobile games have entered a period of careful scrutiny, which brings us to new, present-day regulations. China’s governing body of creative media (the State Administration of Press, Publications, Radio, Film, and Television) is the organization responsible for bans on select books and movies, game consoles (in prior years), excessive gore in games, and now, mobile games. According to this new regulation, any game perceived as being a “story-based game” is subject to review by the State Administration. The approval process can be time consuming due to the limited number of people currently reviewing submissions. This is big news because this approval process is the biggest barrier ever imposed on video game developers looking to enter China. The vast number of mobile games flooding the marketplace quickly drew the attention of Chinese authorities and led to the biggest crackdown on games in China to date. The new regulation was put into effect in July, and since the start of 2016, only 22 non-Chinese mobile games have been released in China (according to a list updated by the State Administration on August 29th). Among the foreign games approved and released this year, the majority were MAJOR foreign IPs, such as Temple Run, Candy Soda Legend, Angry Birds, Subway Surfers, Fruit Ninja, and Monument Valley. If you go to China and check out the App Store now, you will find thousands of unapproved games. The original plan was to pull unapproved games from the marketplace October 1st (but the deadline was extended to December 31st), meaning that any games released in China before this year are likely to be pulled if they don’t attain approval from Chinese authorities. There has been speculation over whether China’s State Administration has the resources and time to pull so many games from the marketplace. However, the new regulation made such big news this summer because many believe China will follow through on this regulation. It may take some time for unapproved games to be pulled (possibly longer than the anticipated end of year deadline), but it is something developers should take note of, to ensure their own games aren’t at risk of being pulled from the Chinese market. There are currently two types of approval processes – an expedited approval process for games without a storyline and an extensive approval process for games with any kind of a storyline. No storyline or an extremely simple storyline. Regulations currently state that the copyright must be owned by a Chinese individual or entity. This means you absolutely must have a Chinese publisher to assist in bringing your game to the Chinese marketplace. No political, military, nationalities, or religious content. All other games must undergo an extensive approval process, often taking 2-4 months for approval (in some cases, approval can even take up to 6 months!). If the studio has a good relationship with the government, it is possible to get approval within 40 days. Submit games 20 days before launch. Submit an extensive amount of paperwork. Send a smartphone to Chinese authorities with a build of the game, functioning SIM card, and data plan for each version of the game (i.e. Android and iPhone). Within one week of launch, submit additional paperwork and details to Chinese authorities. Where Does this Leave Indie Devs? Based on the games released in China this past year, many publishers in China are focused on bringing over games they know will be a hit – games that already made it big and are guaranteed to bring in the big bucks. This means that it is increasingly more difficult for mobile game developers without an already established IP to launch a mobile game within the Chinese market. 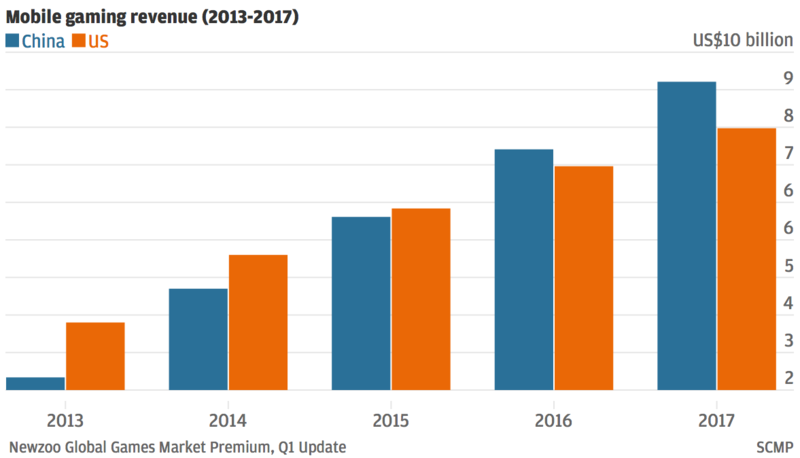 This isn’t to say it can’t be done or that developers shouldn’t target China – the Chinese mobile market alone brings in more revenue than the US! China has already surpassed US revenue from mobile games! This simply means that foreign developers looking to release mobile games in China must find a reputable local partner interested in publishing their games. It is now essential for mobile game developers to work with local partners, as foreign entities are no longer allowed to publish in China. With larger Chinese publishers appearing to support only well-established IPs (i.e. Candy Crush), it may take some time to find a partner willing to publish your game, but quality partners do exist. It can be difficult to conduct business in China as a foreigner. It isn’t uncommon encounter scams and to receive false information from people who claim to be looking out for your best interest. Be wary of scams – there are many scam artist “publishers” or “agents” who are more than willing to take your money. Some people may try to convince you they are an “authorized agent” who can take care of the review process for you. This is not the case! These kinds of scams are a known problem for foreign developers trying to enter the Chinese market. Chinese authorities already released an official answer to clarify that no such “authorized agents” exist. Some developers claim this entire process is one big ruse for corruption, forcing developers to share revenue with already large, local publishers. As with any part of business, don’t enter into any deals you don’t feel comfortable with! Why is a Partner Key to Success in China? China is a country where personal relationships (guan-xi) hold an incredibly amount of importance. Without going through ‘relationship-based channels,’ it is very possible the game you spent so much time and effort developing (and even localizing) for the Chinese market may end up never being released in China. It can be challenging, to say the least, to know which companies you can trust. We would like to take the time to introduce our company – LAI Global Games Services – as we have been helping game developers navigate the global marketplace for decades. LAI has long-standing roots in China and thorough knowledge of the marketplace, as well as localization considerations for the region. LAI has decades of experience in the Asian games market. We started out localizing content for Japanese companies back in 1993, and today, we have offices in China, Japan, and the San Francisco Bay Area, offering game publishing services and 35+ languages for game localization. Due to our long-standing relationship with companies in China, LAI is in the unique position to offer game developers advice on entry into the Chinese market, as well as the best opportunity to actually launch your game in China. How LAI Global Game Services Can Help You! B2B business tips in China. Assistance to help avoid misunderstandings, errors resulting from miscommunication/culture shock. We are always more than happy to assist with any questions you might have about current regulations or partnerships in China. You can reach out to us @LAIGlobalGame or info@lai.com, or better yet, you can contact our CEO, David Lakritz, directly at dave@lai.com! We look forward to your questions and comments! Visit www.lai.com for more information. This entry was posted in China, Most Popular Posts and tagged china, game localization, global game publishing, indie game developers, mobile game developers, new regulations by Karin E. Skoog. Bookmark the permalink.